Create a lighthearted and stylish border in your garden using this Esschert Design Feathered Garden Edge. A bevy of curls and scrolls on these fence sections are sure to capture attention, while directing foot traffic away from your prized plants. A fleur-de-lis finial tops each piece, while a medallion shape occupies the center for added elegance. Feather, scroll, and grape figures form the rest of each section, while the open spaces between these adornments enhance the light feel. 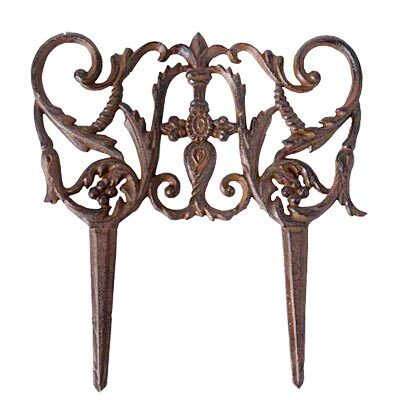 The cast iron construction of the pieces ensures durability, and the brown color meshes with your plants. Black accents on each section lend an aged look to them, and their 5" legs make placement in your soil simple. Highlight your walkway or border your garden in style with this Feathered Garden Edge. Note: This case pack includes 6 of the Esschert Design Feathered Garden Edge sections.